MacEachern first picked up concert bass at 12 and around the same time, discovered metal. Jared recalls, "I heard the song 'Unforgiven' and really liked it. The next day my friend gave me 'Kill 'Em All' and it was over. I became completely enamored with all the metal bands of that time; Metallica, Megadeth, Slayer and Pantera, but when it came to bass, it was all about Cliff Burton, he was, and is my dude." With a brief stint at the Brevard School for Music Performance, Jared has consistently played bass for the past 22 years, most notably in Sanctity, where oddly enough, the band needed a guitar player. "That was purely out of necessity" he explains, "I'd been a bass player, but that gig opened up and I gave it a shot on the 6-stringer." After extensive global touring with Sanctity and the birth of his daughter in 2007, the band's release from their label ignited Jared's sense of responsibility and he quit the band to focus on her. But music stayed a part of his life and he continued to jam locally throughout the south with death metal bands From A Dig and Telic, until he saw Machine Head were in need and thought he'd try out. 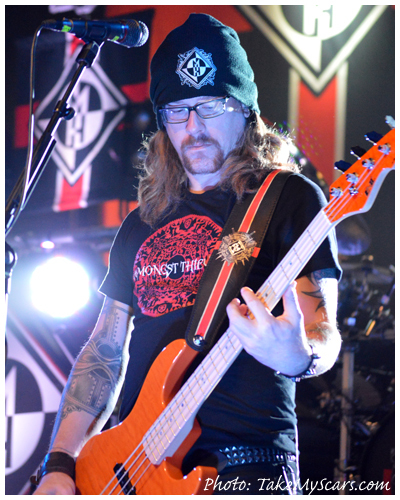 In June 2013, Machine Head announced that Jared MacEachern had joined as an official member, replacing their former bassist and founding member, Adam Duce. The band has already begun rehearsals with MacEachern for the Rockstar Mayhem U.S. summer festival tour and to begin pre-production for the band's upcoming eighth studio album.